The second edition of the Paris-Saclay Junior Conference on Data Science and Engineering took place on the 14 & 15 September 2017at the Auditorium of LAL- Orsay with great success. The JDSE Conference is addressed to PhD students in their first year, M2 students and third year students at Engineering schools at Paris-Saclay. It offers these students the opportunity to present their scientific works developed at internships, or in the first year of thesis, and also to grow their critical sense thanks to a professional conference hosting prestigious invited speakers, academics and industry scientists. 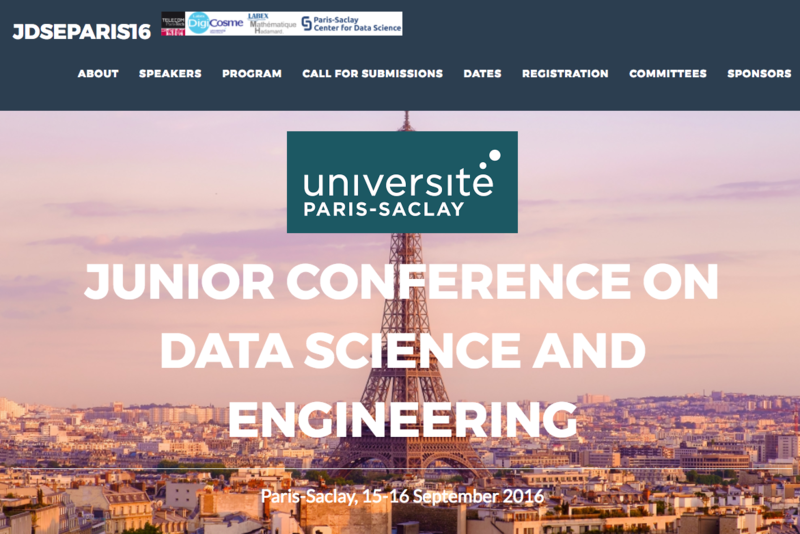 This first edition of the Paris-Saclay Junior Conference on Data Science and Engineering took place in September 2016 and it was addressed to PhD students in their first year, M2 students and third year students at Engineering schools at University Paris-Saclay. It will offer these students the opportunity to present their scientific works developed at internships, or in the first year of thesis, and also to grow their critical sense inside a real conference with prestigious invited Keynotes (Patrick Valduriez, Hervé Jegou, Gabor Lugosi and Isabelle Guyon). The conference took place on September 15-16 2016 at the Auditorium of LAL – Orsay.